Have you ever noticed how most Protestants, no matter how you address the truth of the Orthodox faith, refuse to listen? No, not at all. This is not my own experience. Perhaps you haven't explored all the ways in which the Orthodox Faith can be offered up for discussion. I find that too many contemporary Americans in general share the mentality of "I've made up my mind, don't bother me with the facts." Democrats and Republicans, Protestants and Catholics, Southerners and "Yankees," etc. Everything has become so polarized that people aren't able to consider new information that is contrary to their own worldview. Well then, perhaps you may want to consider changing the title of this thread to something that may invite discussion about this phenomenon of poilarization you encounter rather than alienate an entire group of posters and add to that polarization yourself? The only thing that ticks me off in engaging Protestants is having to defend RCs for a large part of the discussion. Perhaps it's because most Protestants, like most people, aren't interested in getting sucked into a round of religious contentiousness. And I suppose the whole thing is balanced out by all those orthodox who can figure out that Prestantism covers more territory than Southern Baptists. Sadly I find pretty much all of what M7's statements are to be truthful in most cases. But the witness I discovered to reign very true to the Protestants I know is to just live the Orthodox Life, and after the few jokes every season some start joining me in Church or start attending ones close to them. No conversions yet but I do have one Catechumen from my old peer herd. I think we need to try different approaches, as someone else said. I also think that we need to be patient...really, really, really patient. If you try telling a hard-core Serbian person who Christ REALLY is (loving, carring, wants you to take communion) they might flip a lid. So it goes for anyone who has entrenched themselves in one view. My best friend is a Protestant. He is an amazing man. God loving and devout. We have discussed Christian history and theology a great deal. I can say that he is genuinely convinced that Protestantism is true. If he was not convinced of this he would not be a Protestant. I believe he is mistaken in his theology, but I do not doubt for a second that he is following what he believes to be the true expression of Christianity. And there in lies the the complex nature of conversion. If a person truely believes that his religion is true, then he feels no reason to seek out something else. I've wondered that myself. I used to be a very strong Catholic, went to a conservative Catholic school, thought I was going to be a priest, was reading Aquinas on my own and taught a few theology classes, etc. Now I am on my journey to converting to Orthodoxy. Why did I look elsewhere? Partially because of all the mess I saw with Vatican II (I looked at the traditionalists), but I also looked outside Catholicism because I felt something was lacking even in Traditional Catholicism. So you never know, your friend may end up leaving Protestantism . If you asked me 3-4 years ago if I would be where I am right now, I'd tell you that you are crazy. Of course now, I wouldn't seek out anything else, after seeing the beauty and glory of Orthodoxy, I have never seen anything that comes close. Many American Protestants have never even heard of Orthodoxy, and if you try to explain to them what it is, they will brush it off as inconsequential or "the traditions of men" or "not the Bible alone," etc. Or were those three verses deleted from the Biblical Canon of Matthew777?? Making the observation that many people are either unable or unwilling to consider the Orthodox faith in a logical way is not being judgemental, it's being honest. Why hasn't an honest and thorough investigation of Church history converted you to the Orthodox faith? I think the "deal" is that most Protestants rely too much on their emotions in discerning the truth. It is this theatrical and carnal approach to Christianity that sets them apart from both Catholicism and Orthodoxy. Once they have laughed enough, cried enough and hated enough, that's the only time they will seek the kind of spirituality, mysticism and philosophy that only the Orthodox Church can offer. This is a very interesting observation. Can you maybe go into this more? What makes you say this? What do you think is behind it? Etc. Protestants are by definition people who claim they have found the truth based on their emotions, as opposed to their reason, unlike us rational Orthodox and Catholics. Therefore "I think the "deal" is that most Protestants rely too much on their emotions in discerning the truth. It is this theatrical and carnal approach to Christianity that sets them apart from both Catholicism and Orthodoxy." By the way, I am a Lutheran (you know, THOSE Protestants), inquiring into Orthodoxy. Last I checked there was little theatrical carnality in our Lutheran liturgy, just heartfull (you know, that central faculty of the soul) prayer in and with the Spirit and thanks to and in communion with the Lord. Perhaps you didn't get the memo? Or perhaps you think that the TBN crowd is representative of Protestantism? And for the other commenters on this thread, I would note that I have never expected an Orthodox to defend a Catholic on a point of faith - seems kind of like asking a Calvinist to defend a Mormon. Nor do I consider Catholics in general to be other than intelligent, informed, and sincere in their faith, as most Protestants also are (and some are not). That being said, I sometimes wonder about you Orthodox. I am inquiring into Orthodoxy for a number of reasons, but certainly not because Orthodox are somehow inherently more rational or less emotional than us 'Protestants'. Do I detect a bit of sinful pride at work in this Protestant bashing? The Lord moves whom He will for His reasons, not yours. His will be done. By the way again, for those of you who have this chip on your shoulder about how little known or understood Orthodoxy is among Protestants, perhaps you should stop blaming their ignorance on them and look at yourselves. If their ignorance so offends you, it is your responsibility to do something about it. That is what we in the adult world call "taking responsibility", an integral part of "growing up." Now that I think on it, this whole thread reminds me of a conversation I had a few years back with a couple young male co-workers. We were out on the town one night sitting at an outdoor cafe and they were complaining about how they didn't have girlfriends at the time. Meanwhile I looked over and saw plenty of pretty young things also out enjoying the summer evening. So I said to them straight up, "Why are you sitting here over your suds complaining to me about it? If you were really desperate for a girlfriend you would be out there getting one!" At this they both sort of started, looked at me, looked at each other, then one of them said, "Damn, you're absolutely right!" and we all busted out laughing. The moral of the story? Simple: Be a man. If you see something you don't like that you have the power to do something about, don't sit around complaining in your suds to your buds. "The only thing that ticks me off in engaging Protestants is having to defend RCs for a large part of the discussion. A Southern Baptist recently came to my door to invite me to his church for Sunday which then brought on a twenty minute discussion on the faith before he started to get quite distressed by the answers I was giving him, not because they were different from his beliefs but because he thought that they were true. But he began his whole speech by assaulting Roman Catholicism; I had to ask repeatedly to tone down the Catholic bashing. But then I realized that I have done more than my share of that. Otherwise, he was quite cordial and I, in turn, invited him to Saturday Great Vespers and the Liturgy. It seems that Protestantism has become a cultural identity of its own. It's the "I can't become Orthodox because I was born Protestant" excuse. But the truth takes longer with some people; you can only hope and pray. Do I detect a bit of sinful pride at work in this Protestant bashing? I think it's fatigue, actually. You can only listen to someone pontificate on the subject of "But the 2nd Commandment forbids use of these graven images!" in regards to icons only so many times before you start "getting a little snippy about it." That sounds just like the lame excuses used by my friends complaining over their suds about not having girlfriends rather than going out and doing something about it. My advice is the same - deal with your problems directly rather than seeking comfort through suds with buds, otherwise you are just tip-toing effeminately around the problem. Instead of getting "snippy" in a public forum over "Protestants" in general, which is just a way of avoiding any real issues, and which is furthermore an unwarranted, unjustified, and untruthful generalization that is both insulting and discouraging to Protestants like myself, why don't you simply get snippy with the specific people who "fatigue" you? Time to grow up boys, stop blaming your frustrations, failures, and fatiques on Protestants, because your frustrations ultimately stem from something within yourself rather than in the supposed bad behavior of those nasty "others". Okay, that's enough tough love for the day. I'll leave you to your sudsy ponderings. Willfull is a strong word. I beleive some non-Orthodox are willfully ignorant while others are apathetic. In regards to American Culture, I believe many people, Orthodox and non-Orthodox, are ignorant of not only church history but Christian history. I do agree that I hate having to first explain to the ignorant the Orthodoxy is not Catholicism. I would be remis if I didn't tell you that when I was writing my response to the subject of "protecting" RC's I really tried to use my words carefully, so that no one would be offended by them. If that did not happen due to laziness, tired-ness, or any other reason, I sincerely appologize. I think you should also realize that if so many people on this forum are having the same expience, and an non-pleasant one at that, then there's something to be said about it. I like your approach, and your answer. If we spent 1/10th of our time actually doing instead of complaining, we would have a lot less complaining in general. But I also think that its a good idea to bring these things forward and talk about them. At least your friends on the porch were willing to talk about it. A lot of people just sit and stare at their problems go by them, and say nothing. Anyway, I really hope that our idiosyncracies have not detered you in any way. Sometimes when you don't understand something, the dialogue about it can be misunderstanded itself. You missed my point, but whatever...I am not gonna bother myself over you, I do have more important things to do. Then perhaps you could have taken the time to note that I wasn't using it as an excuse for any behavior on my part but was rendering an opinion based upon what I had observed. Don't worry about it, though. Such mis-directed "tough love" is somewhat amusing. Nothing said on these boards will deter me from continuing on the path to Orthdoxy, but I appreciate your comments nonetheless. I expect people to act like, well, the fallen human beings we all are pretty much all the time. I am under no illusion that your average Orthodox is a saint, nor is your average Protestant. So even when people are being deliberately (one might even say 'Willfully') insulting of entire categories of people, I can take it in stride. Of course, that doesn't mean I won't lovingly call them on it, as it would be unChristian of me to not help keep my brother in truth. You aren't fooling anyone you know. will you males knock it off! You guys get your tighties in a bunch over the most absurd things. I was a baptist for 33 years, and i can tell you the language is totally different. The basic understanding of just about every core belief is different. They piece together history as it suits them, leaving out hundreds and hundreds of years and truths that don't sit well. And this practice varies within the many demoms. You have to UNDERSTAND protestant teaching, prot. beliefs in order to minister to them. You have to speak kindly in their "language", or your just another arrogant twit. Just pulling on the many lose threads of their faith while they are at your door isn't enough. Most will walk away not even seeing their nakedness, they are that imbedded in the teaching. I do not say this to put anyone down at all, remember I was protestant far longer than I have been Orthodox. Rather than rant like Yosemite Sam about how ignorant protestants are, do something about your attitude then reach out correctly. You can't be ignorant of what they have been taught and programmed with, then call them ignorant. Not every protestant is ready to hear the truth, remember! Only the Holy Spirit can prepare a fertile heart for a truth so foreign to most of us here in the US. It's FAR easier to remain a protestant that drives a mercedes, lives in a million dollar home and a vacation home, and has the rapture to hang onto. The mind loses a lot when it converts to Orthodoxy, little matter many protestant bastions are false. Also try to keep in mind that M777 has a habit of starting these out of left field or outlandish threads. It amuses most of us other posters too. Perhaps we should rename this the "Sweeping Generalisations Thread". Nah, because then we'd be discriminating against the threads that make sweeping generalizations. You are misconstruing my statement. Don't make it appear that your assumptions are mine. I never said that Orthodoxy relies on reason, nor did I say that the Protestants discovered the truth based on their emotions. By the way, I am a Lutheran (you know, THOSE Protestants), inquiring into Orthodoxy. Last I checked there was little theatrical carnality in our Lutheran liturgy, just heartfull (you know, that central faculty of the soul) prayer in and with the Spirit and thanks to and in communion with the Lord. Perhaps you didn't get the memo? I believe that carnality is a general characteristic of Western Christianity. Roman Catholicism introduced it, and Protestantism elevated it to another level. One can better understand this by comparing western art with Orthodox iconography. Also from Photios Kontoglou: "The works of Western religious art are emotional and dramatic. The dramatic element is carnal, even though it is thought to be spiritual. In the Orthodox icon there exists the liturgical element. Wherever the liturgical element is present, there the dramatic and emotional [or carnal] element is neutralized. In the works of Western religious art there is no spiritual ascent. The saints, Christ, the All-holy Mother of God are simply people painted from life, ordinary people who portray Christ, the All-holy One, or the saints. With us the iconographer is not an ordinary painter as in the West; he has a special service [liturgy] to perform through this art, a spiritual service [liturgy] and for this reason his is called "iconographer". Or perhaps you think that the TBN crowd is representative of Protestantism? Talk about elevating carnality to the HIGHEST level. And for the other commenters on this thread, I would note that I have never expected an Orthodox to defend a Catholic on a point of faith - seems kind of like asking a Calvinist to defend a Mormon. I am also one of those who defend the Catholic Faith next to Orthodoxy. Ironic isnÃ¢â‚¬â„¢t it? Do you not detect "sinful pride" in taking potshots at the TBN crowd? I don't. In the first place, criticizing religios groups for being emotional is not bashing. But we should know who we are dealing with first--in this case, the Protestants--before we introduce Orthodoxy to them. But don't expect us to knock on your door. You have to go out and seek for yourself. The doors of Orthodoxy are open to those who want to come in. In fact, I would LOVE to hear what you think we are getting our "tighties in a bunch over"
The mind loses a lot when it converts to Orthodoxy, little matter many protestant bastions are false. Would you mind following this up with something...more substantive? I didn't misconstrue your assumptions as you haven't stated them. I asked what your assumptions were, and stated that I suspected some question begging may be (not 'is') occuring. As you still haven't defined 'Protestantism' I have no way of really knowing what your assumptions are. You can believe whatever you want, but assertions are not arguments. So I ask you to prove it - make a real argument so we can examine your premises and evidences. It would help if you would first define what exactly you mean by 'Protestantism' and 'Western Christianity' before making your argument for general characteristics. Otherwise you are just making blanket assertions that no one can discuss or refute since only you know what you mean or who you are referring to. I think this author is trying to compare apples to oranges to make a predetermined point. He talks about western secular art on religious themes, such as by Grunwald. Then he compares that to Orthodox art used for liturgical purposes. I would agree that secular art on religious themes is inherently carnal - that is why it is 'secular'. I even agree that Western art tends towards realism since the Renaissance. However, I totally disagree with his claim that one can properly compare western secular art with eastern liturgical art and thereby make some claim as to the inferiority of western liturgical art or practice. To make the comparison apples to apples one needs to compare the use of aesthetics in the actual organized non-secular worship - the images, rituals, architecture, music, etc. Only then can you decide whether carnality is a general characteristic of either Protestantism or Western Christianity, or both. To do the comparison properly would require that we examine the various styles of liturgical art used in the West, which naturally requires that we have a clear idea of the various categories, such as 'Protestant', Roman Catholic, non-Protestant Christian, etc. Even before you start, however, I state that you are going to have a hard time arguing that the simplicity and abstract character of traditional Protestant liturgy is very carnal. If anything, carnality is a criticism that Protestants level against Orthodox (though I think this is a mistaken charge), just as they have traditionally leveled it against Catholics with their realistic and emotional statuary, crucifixes, murals, etc. Yes, I agree many there is a distinct section of American Christendom that is prone emotionalism and drama, maybe even a few modern Protestant denominations qualify as many have drifted from the principles of the reformation. So what? You STILL haven't given a clear definition of what you mean by 'Protestant'. And I went to a Catholic university and have enormous respect for the Catholic faith and heritage. I too would defend Catholics against unwarranted criticism. I would also defend Orthodox, Baptists, Muslims, Jews, and Buddhists and any other tradition against false charges. Ironic isn't it? Actually what I said is that I wouldn't expect an Orthodox (or any non-Catholic for that matter) to defend a Catholic point of faith. If they wished to do so and were able to do so that would of course be just fine. I like truth and precision, which is why I'm insisting on you clearly defining 'Protestantism'. You are correct, I retract my comment and sincerely apologize to any and all devotees of TBN for making it. I think it would be appropriate for others here to also retract blanket and unwarranted statements about Protestantism, which I note once again that you haven't defined. I agree, you SHOULD know who you are dealing with before trying to evangelize them, that way you don't make unwarranted blanket statements that immediately discredit your evangelical efforts. It would help if you first defined who you mean when you say 'Protestant' so that WE know who you THINK you are dealing with, as well as knowing who you think you are NOT dealing with. I have sought for myself, and I agree the doors of Orthodoxy are generally open (if you go to a congregation that is open to converts). I have had no negative experiences in this regard for which I am thankful, but what's your point? Until you define your terms you are just making unwarranted blanket statements about millions of undefined people. Even if I didn't consider myself a Protestant or wasn't moving towards Orthodoxy I would STILL step up and defend Protestants against the kinds of ignorant blanket statements made by many in this thread. There's nothing personal in this for me, except not letting falsehood lie unanswered. There are far too many falsehoods passed around casually these days, particularly in the form of unsupported generalizations, and Internet boards are often the worst. Here's the deal. If you want to critique Protestantism that's fine by me, there's a lot there worth looking at. But make darn sure you aren't judging Protestants by the characteristics of non-Protestant Christians. And also make darn sure that you aren't taking a few anecdotal or personal experiences and blowing them up into blanket assertions about millions of real Protestants. I'm a statistician so I expect at least an attempt to present solid evidence on claims about large and diverse populations, but first I'd like you to precisely define your terms so we know what groups you are including and excluding. You have to UNDERSTAND protestant teaching, prot. beliefs in order to minister to them. You have to speak kindly in their "language", or your just another arrogant twit. It is not "left field" to make the observation that to understand history is to seize being a Protestant. Evangelical Protestant: Do you have Jesus in your heart as your personal savior? Orthodox Christian: Yes, but there is much more to the faith than that. Accepting Christ is only the beginning of salvation. Evangelical Protestant: Oh, so you believe in salvation by works? Orthodox Christian: Sola Fide is a relatively recent idea, you must understand that. What do you know concerning the history surrounding the New Testament? How long did Christianity exist before the Reformation? How can you understand Scripture once removed from the context of the Apostolic Fathers? Evangelical Protestant: I believe in Jesus, and that's all that matters! Don't bother me with your church history! Orthodox Christian: I have this short book, an Orthodox Christian Response to Evangelical Claims, would you care to read it? Evangelical Protestant: I'm set in my beliefs, thank you very much! Orthodox Christian: You need not change your mind, but at least you could understand where I'm coming from. Evangelical Protestant: I said I've made up my mind!!! This kind of behavior, in other circumstances other than religious, would be attributed to mental illness. This salvation by faith alone concept has gone so far that facts no longer matter. But my decision to become an Orthodox Christian was based in fact, that only the Orthodox Church could trace itself, theologically, liturgically, and historically, to the earliest Christian communities. Close-mindedness is a human problem; not a strictly "Evangelical" one. I'm quite certain that many Orthodox are close-minded and not even willing to seriously consider the reasons why those Protestants with genuine and well-thought out objections to Orthodoxy hold to those objections in the first place. In any event, you disturbingly speak of Orthodoxy as if it is some sort of abstract truth to be logically deduced from a set of historical premises. If I were you, I would invest more time understanding what Orthodoxy actually is than making open-blanket criticisms of those who don't know it any better than you do. Oh, please. This is one of THE lamest East vs. West comparisons out there. A REAL hyper-Protestant would point out that Eastern liturgical art and architecture are emotional and dramatic out the wazoo. And while we're at it, you can find easily enough those who will say that using a real person as the model for Christ emphasizes his humanity in a way that Eastern iconography incorrectly obscures. Not every difference is meaningful, but it's imprtant that the difference actually exists. I think what Photios Kontoglou is referring to is the rules of Orthodox iconography to portray all figures in icons as "dispassionate". We are forbidden to portray Christ's face as being tormented in agony on the Cross, for example. Thus, a martyr's face is shown as unmoved even during their torture, and the one executing them is similarly depicted as dispassionate. Saints and evildoers are portrayed the same way in icons except for haloes. 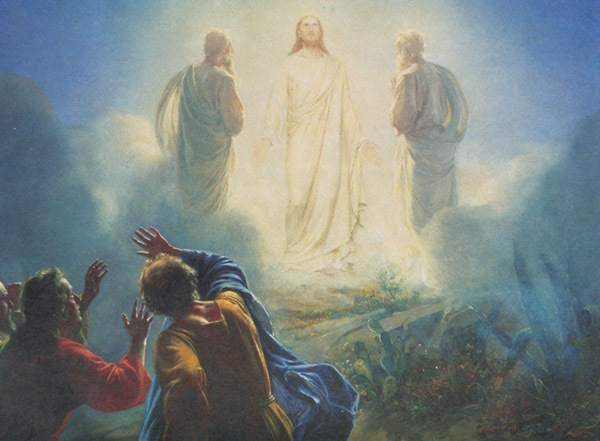 Similarly, the expression of Christ's Face in the Icon of the Transfiguration is no different to the expression on His Face in the "Nymphios" ("Ecce Homo") Icon. Compare the expression on Christ's face in these two icons. And in the Icon of the beheading of St. John the Baptist, there is little to distinguish the executioner's face from St. John's other than St. John's halo, and they certainly show no signs of emotion, not even Salome. Why hasn't an honest and thorough investigation of Church history converted <xyz Protestant> to the Orthodox faith? Protestantism is fundamentally ahistorical. Its various forms are built on denial or disregard for whole portions of the received tradition of the church (and in some places on insertions of invented history such as with the Mormons). One of course may go back and revisit oneÃ¢â‚¬â„¢s assumptions, but you canÃ¢â‚¬â„¢t get around the fact that the founders of the Reformation started out by tossing things in the trash heap (literally and figuratively). Complete (or near complete) reliance on individual autonomy and authority. Distrust and suspicion of institutions and hierarchy. Emphasis on the spiritual and not the material (in other words quasi to full Gnosticism). Iconoclasm (related to the previous). A general disinterest in history itself. So on and so forth. IÃ¢â‚¬â„¢m sure there are other reasons why simply a "reading of church history" would do nothing to sway people. I know it wouldn't have worked on my wife. I think really we have to drop some of our hubris though. The fact is many more people become Protestant (and leave Orthodoxy and Catholicism) than go the other direction. Pentecostals are exploding in terms of numbers in the Global South (read the excellent study by Philip Jenkins on this). What is it in Protestantism that resonates with these people and where are we failing? That seems like a worthy question for consideration. I have to admit that the original Lutherans, who are immediate offspring of the Roman Catholics as opposed to the Evangelicals who came in much later, are much less carnal in their worship. I would also confess that since becoming Orthodox, I have developed a tendency to lump together all the groups that formed after 1517 into one denomination and dare call it "Protestants" in much the same way that a typical Christian would lump together the various forms of Islam. For this, I apologize. I suppose that slight differences in doctrine become irrelevant when one discovers a totally different brand of Christianity. Take note that I am not the only one who sees it this way. The chart in the following doesn't even mention the names of the splinter groups! Anyway, you have made it perfectly clear that you are a Lutheran. We appreciate that. You have also expressed the importance of being specific when conversing with "Protestants." I now realize that there is no single approach to introducing Orthodoxy in the West. It is imperative therefore that we employ specific methods for each "Protestant" denomination. More importantly, after opening your mind to Orthodoxy, I suppose that you are in the best position to suggest as to how we Orthodox could effectively share what we know to your Lutheran brethren. For instance, Where do we begin? Do we go about discussing Church history, or is questioning the validity of the juridic concept of atonement a valid starting point? Finally, it would also help us if you could relate your experience and identify the points of interest which led you to explore the Orthodox Church. It's not really fair to take a Caravaggio and some other Italian Catholic painter as representing a Protestant aesthetick, though. A really hardline Protestant would of course reject liturgical imagery at all. An Anglican would tend to reject the notion that the images needed to be so stylized, but would tend in practice to have much more stylized images in church than those Italianate examples. The true East/West difference is that there is consensus in the East and no consensus in the West; and even then, one notes in Slavic iconography that nasty Western influence in some periods. One could make something of an argument for an Orthodox vs. Catholic difference, but then one runs into the more dominating difference that the Catholic perspective has changed dramatically over the years. Again, a Protestant might say (and with quite a bit of justification actually) that the differences in artistic taste between Constantinople and Rome are insignificant in comparison to their common acceptance of ornament and imagery in the church. I generally assume that when someone in an Orthodox forum makes some sort of statement about "protestants" or "protestantism", it's going to be a wildly inaccurate and typically tendentious overgeneralization. There are some common points to different sorts of Protestants, but they are as a rule either so high level or so utterly historical as to be unhelpful on any specific point. Woah there. Photios Kontoglou was one of Greek Orthodoxy's most famous modern Iconographers, and he is talking about Eastern Orthodox Iconography vs Western Christian Religious art. He is not talking specifically about Protestant asthetic- and neither am I. I was simply trying to say that, in context, Photios Kontoglou's quoted statement is in fact an accurate observation. He is comparing Roman Catholic and Eastern Orthodox devotional art. It's not really fair to take a Caravaggio and some other Italian Catholic painter as representing a Protestant aesthetick, though. A really hardline Protestant would of course reject liturgical imagery at all. They may have rejected the imagery, but being children of Roman Catholicism, have they rejected the philosophy and theology behind it? Again, a Protestant might say (and with quite a bit of justification actually) that the differences in artistic taste between Constantinople and Rome are insignificant in comparison to their common acceptance of ornament and imagery in the church. It's not even about "artistic taste". I used western art to make the carnal aspect visible to the audience. But that's just the tip of the iceberg. It has been commonly understood by experts that art tells two stories. First it tells the story represented by the picture itself. It can be a portrait, a landscape, a biblical scene, a magnificent cathedral, and just about anything that the artist desires to paint. We appreciate the fact that man has the ability to reproduce, often to exact likeness, what he sees in the world around him. Second, and probably most important, the painting tells us about the philosophy, the theology, the culture and even the personality of the painter and his times. Hidden within almost every artwork produced by the famous artists is a commentary on life itself, often a deep commentary. Starting our analysis with the Byzantine period (400-1400), we have a form of art that is definitely cast into the Christian mold. Since the church held sway in the period of the Middle Ages, the art of Europe and many parts of the east was financially supported and inspired by the Catholic Church. As such, Byzantine art was more or less confined to representing the doctrines and moods of the Church. The object of art was the institution as opposed to the individual, although this would surely change in later periods. Byzantine art did not portray family or city life as we would understand it today. Only late Byzantine art, the Gothic period, provides the first glimpse into the city, but then only to magnify the presence of the great Gothic cathedrals. [D]. In this period there are some striking characteristics. The reason is not precisely known, but the art of the Byzantine period is very abstract, that is, it had little resemblance to actual material things. It was concerned more with concepts. The abstraction in Byzantine art grew out of the church's practice to put both practical and spiritual life into symbols. Much of the populace was uneducated, and thus the Church displayed the meaning of life through symbolic representations in art. The artist was not concerned with historical events as such, nor with archeological accuracy, but with dogma in the credal statements. The mystique of Mary, the saints, the sacraments, transubstantiation and the allegorical method of biblical interpretation, were all subjects of symbolic art designed to fathom the mysteries of the supernatural. The shift away from the mystical in the Gothic period was due in large part to the developing philosophy of Thomas Aquinas. Prior to Aquinas, philosophy and theology were dominated by the Platonism or Neo-Platonism of Augustine. The emphasis was on the universals, and thus the spiritual, heavenly or ethereal things. Life was explained with reference to the "ideal" image, not the real image. With the discovery of an Aristotelian library in the middle east, Aristotle's "particularist" philosophy became prominent in the late Middle Ages. This philosophy concentrated on the details and specifics of life, things in themselves. Aquinas incorporated much of Aristotle's thought-forms and methodology, even in his explanation of church doctrines and theology (e.g., transubstantiation and natural law). As a result of Aquinas' incorporation of Aristotelian thought-forms, man began to have a greater appreciation of nature and the natural. As we will see later, the focus on nature was taken to greater heights, or we might say, taken to the extreme, in the Renaissance, a level that certainly would have displeased St. Thomas. Note that this was written by Robert Sungenis, a Roman Catholic. And, by the way, it gets better on the second page where Mr. Sungenis discusses the Reformation.